The aggregate market value of the Common Stock, par value $1.00 per share, held by non-affiliates of the registrant as of June 1, 2018 was approximately $2,601,453,076 (based on the closing price of such stock as quoted on the New York Stock Exchange of $51.84 on such date). The number of shares outstanding of the Registrant’s Common Stock, par value $1.00 per share, was 50,767,021 as of January 22, 2019. Part III incorporates information by reference to portions of the registrant’s Proxy Statement for the Annual Meeting of Shareholders to be held on April 4, 2019. H.B. Fuller Company was founded in 1887 and incorporated as a Minnesota corporation in 1915. Our stock is traded on the New York Stock Exchange (“NYSE”) under the ticker symbol FUL. As used herein, “H.B. Fuller”, “we”, “us”, “our”, “management” or “company” includes H.B. Fuller and its subsidiaries unless otherwise indicated. Where we refer to 2018, 2017 and 2016 herein, the reference is to our fiscal years ended December 1, 2018, December 2, 2017 and December 3, 2016, respectively. We are a leading worldwide formulator, manufacturer and marketer of adhesives, sealants and other specialty chemical products. Sales operations span 34 countries in North America, Europe, Latin America, the Asia Pacific region, India, the Middle East and Africa. Industrial adhesives represent our core product offering. Customers use our adhesives products in manufacturing common consumer and industrial goods, including food and beverage containers, disposable diapers, windows, doors, flooring, roofing, appliances, sportswear, footwear, multi-wall bags, water filtration products, insulation, textiles, automobiles, recreational vehicles, buses, trucks and trailers, marine products, solar energy systems, electronics and products for the aerospace and defense industries. Our adhesives help improve the performance of our customers’ products or improve their manufacturing processes. We also provide our customers with technical support and unique solutions designed to address their specific needs. In addition, we have established a variety of product offerings for residential construction markets, such as tile-setting adhesives, grouts, sealants and related products. On November 1, 2017, we acquired Adecol Industria Quimica, Limitada (“Adecol”), headquartered in Guarulhos, Brazil. Adecol works with customers to develop innovative, high-quality hot melt, reactive and polymer-based adhesive solutions in the packaging, converting and durable assembly markets. The purchase price of $40.3 million was funded through borrowings on our revolving credit facility and existing cash and is reported in our Americas Adhesives operating segment. On October 20, 2017, we acquired Royal Adhesives and Sealants (“Royal Adhesives”), a manufacturer of high-value specialty adhesives and sealants. Royal Adhesives is a supplier of industrial adhesives in a diverse set of end markets, including aerospace, transportation, commercial roofing, insulating glass, solar, packaging and flooring applications and operates 19 manufacturing facilities in five countries. The purchase price of $1,620.3 million was funded through new debt financing. Royal Adhesives is included in multiple operating segments. On January 27, 2017, we acquired substantially all of the assets of H.E. Wisdom & Sons, Inc. and its affiliate Wisdom Adhesives Southeast, L.L.C., (“Wisdom Adhesives”) headquartered in Elgin, Illinois. Wisdom Adhesives is a provider of adhesives for the packaging, paper converting and durable assembly markets. The purchase price of $123.5 million was financed through borrowings on our revolving credit facility and is reported in our Americas Adhesives operating segment. The principal markets, products and methods of distribution outside the United States vary with each of our regional operations, generally maintaining integrated business units that contain dedicated supplier networks, manufacturing, logistics and sales organizations. The vast majority of the products sold within any region are produced within the region, and the respective regions do not import significant amounts of product from other regions. As of December 1, 2018, we had sales offices and manufacturing plants in 21 countries outside the United States and satellite sales offices in another 12 countries. We have detailed Code of Conduct policies that we apply across all of our operations around the world. These policies represent a set of common values that apply to all employees and all of our business dealings. We have adopted policies and processes, and conduct employee training, all of which are intended to ensure compliance with various economic sanctions and export controls, including the regulations of the U.S. Treasury Department’s Office of Foreign Assets Control (“OFAC”). We do not conduct any business in the following countries that are subject to U.S. economic sanctions: Cuba; Iran; North Korea; Syria and the Crimea region of the Ukraine. See Item 3. Legal Proceedings for additional disclosures regarding past business conducted in Iran. Many of our markets are highly competitive. However, we compete effectively due to the quality and breadth of our adhesives, sealants and specialty chemical portfolio and the experience and expertise of our commercial organizations. Within the adhesives and other specialty chemical markets, we believe few suppliers have comparable global reach and corresponding ability to deliver quality and consistency to multinational customers. Our competition is made up generally of two types of companies: (1) similar multinational suppliers and (2) regional or specialty suppliers that typically compete in only one region or within a narrow geographic area within a region. The multinational competitors typically maintain a broad product offering and range of technology, while regional or specialty companies tend to have limited or more focused product ranges and technology. Principal competitive factors in the sale of adhesives and other specialty chemicals are product performance, supply assurance, technical service, quality, price and customer service. We have cultivated strong, integrated relationships with a diverse set of customers worldwide. Our customers are among the technology and market leaders in consumer goods, construction, and industrial markets. We pride ourselves on long-term, collaborative customer relationships and a diverse portfolio of customers in which no single customer accounted for more than 10 percent of consolidated net revenue. Our leading customers include manufacturers of food and beverages, hygiene products, clothing, major appliances, electronics, automobiles, aerospace and defense products, solar energy systems, filters, construction materials, wood flooring, furniture, cabinetry, windows, doors, tissue and towel, corrugation, tube winding, packaging, labels and tapes. Our products are delivered directly to customers primarily from our manufacturing plants, with additional deliveries made through distributors and retailers. No significant backlog of unfilled orders existed at December 1, 2018 or December 2, 2017. We use several principal raw materials in our manufacturing processes, including tackifying resins, polymers, synthetic rubbers, vinyl acetate monomer and plasticizers. We generally avoid sole source supplier arrangements for raw materials. The majority of our raw materials are petroleum/natural gas based derivatives. Under normal conditions, raw materials are available on the open market. Prices and availability are subject to supply and demand market mechanisms. Raw material costs are primarily determined by the balance of supply against the aggregate demand from the adhesives industry and other industries that use the same raw material streams. The cost of crude oil and natural gas, the primary feedstocks for our raw materials, can also impact the cost of our raw materials. Much of the technology we use in our products and manufacturing processes is available in the public domain. For technology not available in the public domain, we rely on trade secrets and patents when appropriate to protect our competitive position. We also license some patented technology from other sources. Our business is not materially dependent upon licenses or similar rights or on any single patent or group of related patents. We enter into agreements with many employees to protect rights to technology and intellectual property. Confidentiality commitments also are routinely obtained from customers, suppliers and others to safeguard proprietary information. We own numerous trademarks and service marks in various countries. Trademarks, such as H.B. Fuller®, Swift®, Advantra®, Clarity®, Sesame®, TEC®, Foster®, Rakoll®, Rapidex®, Full-CareTM, Thermonex®, Silaprene®, Eternabond®, Cilbond®, and TONSAN® are important in marketing products. Many of our trademarks and service marks are registered. U.S. trademark registrations are for a term of ten years and are renewable every ten years as long as the trademarks are used in the regular course of trade. Our investment in research and development creates new and innovative adhesive technology platforms, enhances product performance, ensures a competitive cost structure and leverages available raw materials. New product development is a key research and development outcome, providing higher-value solutions to existing customers or meeting new customers’ needs. Projects are developed in local laboratories in each region, where we understand our customer base the best. Platform developments are coordinated globally through our network of laboratories. Through designing and developing new polymers and new formulations, we expect to continue to grow in our current markets. We also develop new applications for existing products and technologies, and improve manufacturing processes to enhance productivity and product quality. Research and development efforts are closely aligned to customer needs, but we do not engage in customer sponsored activities. We foster open innovation, seek supplier-driven new technology and use relationships with academic and other institutions to enhance our capabilities. We comply with applicable regulations relating to environmental protection and workers' safety. This includes regular review of and upgrades to environmental, health and safety policies, practices and procedures as well as improved production methods to minimize our facilities’ outgoing waste, based on evolving societal standards and increased environmental understanding. Expenditures to comply with environmental regulations over the next two years are estimated to be approximately $13.8 million, including approximately $1.4 million of capital expenditures. See additional disclosure under Item 3. Legal Proceedings. Our operating segments have historically had lower net revenue in winter months, which is primarily our first fiscal quarter, mainly due to international holidays and the seasonal decline in construction and consumer spending activities. We employed approximately 6,500 individuals on December 1, 2018, of which approximately 2,700 were located in the United States. The following table shows the name, age and business experience for the past five years of the executive officers as of January 7, 2019. Unless otherwise noted, the positions described are positions with the company or its subsidiaries. The Board of Directors elects the executive officers annually. For more information about us, visit our website at: www.hbfuller.com. We file annual, quarterly and current reports, proxy statements and other information with the Securities and Exchange Commission (“SEC”) via EDGAR. Our SEC filings are available free of charge to the public at our website as soon as reasonably practicable after they have been filed with or furnished to the SEC. As a global manufacturer of adhesives, sealants and other specialty chemical products, we operate in a business environment that is subject to various risks and uncertainties. Below are the most significant factors that could adversely affect our business, financial condition and results of operations. Uncertainties in foreign economic, political, regulatory and social conditions and fluctuations in foreign currency may adversely affect our results. Approximately 55 percent, or $1.7 billion, of our net revenue was generated outside the United States in 2018. International operations could be adversely affected by changes in economic, political, regulatory, and social conditions, especially in Brazil, Russia, China, the Middle East, including Turkey and Egypt, and other developing or emerging markets where we do business. An economic downturn in the businesses or geographic areas in which we sell our products could reduce demand for these products and result in a decrease in sales volume that could have a negative impact on our results of operations. Product demand often depends on end-use markets. Economic conditions that reduce consumer confidence or discretionary spending may reduce product demand. Challenging economic conditions may also impair the ability of our customers to pay for products they have purchased, and as a result, our reserves for doubtful accounts and write-offs of accounts receivable may increase. In addition, trade protection measures, anti-bribery and anti-corruption regulations, restrictions on repatriation of earnings, differing intellectual property rights and changes in legal and regulatory requirements that restrict the sales of products or increase costs could adversely affect our results of operations. Fluctuations in exchange rates between the U.S. dollar and other currencies could potentially result in increases or decreases in net revenue, cost of raw materials and earnings and may adversely affect the value of our assets outside the United States. In 2018, the change in foreign currencies negatively impacted our net revenue by approximately $2.0 million. In 2018, we spent approximately $1.7 billion for raw materials worldwide of which approximately $869.1 million was purchased outside the United States. Based on 2018 financial results, a hypothetical one percent change in our cost of sales due to foreign currency rate changes would have resulted in a change in net income of approximately $8.3 million or $0.16 per diluted share. Although we utilize risk management tools, including hedging, as appropriate, to mitigate market fluctuations in foreign currencies, any changes in strategy in regard to risk management tools can also affect revenue, expenses and results of operations and there can be no assurance that such measures will result in cost savings or that all market fluctuation exposure will be eliminated. Distressed financial markets may result in dramatic deflation of financial asset valuations and a general disruption in capital markets. Adverse equity market conditions and volatility in the credit markets could have a negative impact on the value of our pension trust assets, our future estimated pension liabilities and other postretirement benefit plans. In addition, we could be required to provide increased pension plan funding. As a result, our financial results could be negatively impacted. Reduced access to capital markets may affect our ability to invest in strategic growth initiatives such as acquisitions. In addition, the reduced credit availability could limit our customers’ ability to invest in their businesses, refinance maturing debt obligations, or meet their ongoing working capital needs. If these customers do not have sufficient access to the financial markets, demand for our products may decline. The interest rates of our term loans are priced using a spread over LIBOR. LIBOR, the London interbank offered rate, is the basic rate of interest used in lending between banks on the London interbank market and is widely used as a reference for setting the interest rate on loans globally. We typically use LIBOR as a reference rate in our term loans such that the interest due to our creditors pursuant to a term loan extended to us is calculated using LIBOR. Most of our term loan agreements contain a stated minimum value for LIBOR. On July 27, 2017, the United Kingdom’s Financial Conduct Authority, which regulates LIBOR, announced that it intends to phase out LIBOR by the end of 2021. It is unclear if at that time whether or not LIBOR will cease to exist or if new methods of calculating LIBOR will be established such that it continues to exist after 2021. The U.S. Federal Reserve, in conjunction with the Alternative Reference Rates Committee, a steering committee comprised of large U.S. financial institutions, is considering replacing U.S. dollar LIBOR with a new index calculated by short-term repurchase agreements, backed by Treasury securities (“SOFR”). SOFR is observed and backward looking, which stands in contrast with LIBOR under the current methodology, which is an estimated forward-looking rate and relies, to some degree, on the expert judgment of submitting panel members. Given that SOFR is a secured rate backed by government securities, it will be a rate that does not take into account bank credit risk (as is the case with LIBOR). SOFR is therefore likely to be lower than LIBOR and is less likely to correlate with the funding costs of financial institutions. Whether or not SOFR attains market traction as a LIBOR replacement tool remains in question. As such, the future of LIBOR at this time is uncertain. If LIBOR ceases to exist, we may need to renegotiate our credit agreements with that utilize LIBOR as a factor in determining the interest rate to replace LIBOR with the new standard that is established. Increases in prices and declines in the availability of raw materials could negatively impact our financial results. In 2018, raw material costs made up approximately 75 percent of our cost of sales. Accordingly, changes in the cost of raw materials can significantly impact our earnings. Raw materials needed to manufacture products are obtained from a number of suppliers and many of the raw materials are petroleum and natural gas based derivatives. Under normal market conditions, these raw materials are generally available on the open market from a variety of producers. While alternate supplies of most key raw materials are available, supplier production outages may lead to strained supply-demand situations for certain raw materials. The substitution of key raw materials requires us to identify new supply sources, reformulate and re-test and may require seeking re-approval from our customers using those products. From time to time, the prices and availability of these raw materials may fluctuate, which could impair our ability to procure necessary materials, or increase the cost of manufacturing products. If the prices of raw materials increase in a short period of time, we may be unable to pass these increases on to our customers in a timely manner and could experience reductions to our profit margins. Based on 2018 financial results, a hypothetical one percent change in our raw material costs would have resulted in a change in net income of approximately $12.1 million or $0.23 per diluted share. We experience substantial competition in each of the operating segments and geographic areas in which we operate. Our wide variety of products are sold in numerous markets, each of which is highly competitive. Our competitive position in markets is, in part, subject to external factors. For example, supply and demand for certain of our products is driven by end-use markets and worldwide capacities which, in turn, impact demand for and pricing of our products. Many of our direct competitors are part of large multinational companies and may have more resources than we do. Any increase in competition may result in lost market share or reduced prices, which could result in reduced profit margins. This may impair the ability to grow or even to maintain current levels of revenues and earnings. While we have an extensive customer base, loss of certain top customers could adversely affect our financial condition and results of operations until such business is replaced, and no assurances can be made that we would be able to regain or replace any lost customers. Failure to develop new products and protect our intellectual property could negatively impact our future performance and growth. Ongoing innovation and product development are important factors in our competitiveness. Failure to create new products and generate new ideas could negatively impact our ability to grow and deliver strong financial results. We continually apply for and obtain U.S. and foreign patents to protect the results of our research for use in our operations and licensing. We are party to a number of patent licenses and other technology agreements. We rely on patents, confidentiality agreements and internal security measures to protect our intellectual property. Failure to protect this intellectual property could negatively affect our future performance and growth. We may be required to record impairment charges on our goodwill or long-lived assets. Weak demand may cause underutilization of our manufacturing capacity or elimination of product lines; contract terminations or customer shutdowns may force sale or abandonment of facilities and equipment; or other events associated with weak economic conditions or specific product or customer events may require us to record an impairment on tangible assets, such as facilities and equipment, as well as intangible assets, such as intellectual property or goodwill, which would have a negative impact on our financial results. Catastrophic events could disrupt our operations or the operations of our suppliers or customers, having a negative impact on our financial results. Unexpected events, including natural disasters and severe weather events, fires or explosions at our facilities or those of our suppliers, acts of war or terrorism, supply disruptions or breaches of security of our information technology systems could increase the cost of doing business or otherwise harm our operations, our customers and our suppliers. Such events could reduce demand for our products or make it difficult or impossible for us to receive raw materials from suppliers and deliver products to our customers. We rely on information technology to record and process transactions, manage our business and maintain the financial accuracy of our records. Our computer systems are subject to damage or interruption from various sources, including power outages, computer and telecommunications failures, computer viruses, security breaches, vandalism, catastrophic events and human error. Interruptions of our computer systems could disrupt our business, for example by leading to plant downtime and/or power outages, and could result in the loss of business and cause us to incur additional expense. Information technology security threats are increasing in frequency and sophistication. Our information technology systems could be breached by unauthorized outside parties or misused by employees or other insiders intent on extracting sensitive information, corrupting information or disrupting business processes. Such unauthorized access and a failure to effectively recover from breaches could compromise confidential information, disrupt our business, harm our reputation, result in the loss of assets including trade secrets and other intellectual property, customer confidence and business, result in regulatory proceedings and legal claims, and have a negative impact on our financial results. We are in the process of implementing a global Enterprise Resource Planning (“ERP”) system that we refer to as Project ONE, which will upgrade and standardize our information system. The North America adhesives business went live in 2014. In 2017, we began the implementation and upgrade of our ERP system in our Latin America adhesives business and implementation for all countries, with the exception of Brazil, has been completed as of the end of 2018. During 2019 and beyond, we will continue implementation in North America, EIMEA (Europe, India, Middle East and Africa) and Asia Pacific. Any delays or other failure to achieve our implementation goals may adversely impact our financial results. In addition, the failure to either deliver the application on time or anticipate the necessary readiness and training needs could lead to business disruption and loss of business. Failure or abandonment of any part of the ERP system could result in a write-off of part or all of the costs that have been capitalized on the project. Risks associated with acquisitions could have an adverse effect on us and the inability to execute organizational restructuring may affect our results. As part of our growth strategy, we have made and intend to pursue additional acquisitions of complementary businesses or products and joint ventures. The ability to grow through acquisitions or joint ventures depends upon our ability to identify, negotiate, complete and integrate suitable acquisitions or joint venture arrangements. If we fail to successfully integrate acquisitions into our existing business, our results of operations and our cash flows could be adversely affected. Our acquisition strategy also involves other risks and uncertainties, including distraction of management from current operations, greater than expected liabilities and expenses, inadequate return on capital, unidentified issues not discovered in our investigations and evaluations of those strategies and acquisitions and difficulties implementing and maintaining consistent standards, controls, procedures, policies and systems. Future acquisitions could result in debt, dilution, liabilities, increased interest expense, restructuring charges and amortization expenses related to intangible assets. In addition, our profitability is dependent on our ability to drive sustainable productivity improvements such as cost savings through organizational restructuring. Delays or unexpected costs may prevent us from realizing the full operational and financial benefits of such restructuring initiatives and may potentially disrupt our operations. We may not realize the revenue growth opportunities and cost synergies that are anticipated from the Royal Adhesives acquisition as we may experience difficulties in integrating Royal Adhesives’ business with ours. The benefits that are expected to result from the Royal Adhesives acquisition will depend, in part, on our ability to realize the anticipated revenue growth opportunities and cost synergies as a result of the acquisition. Our success in realizing these revenue growth opportunities and cost synergies, and the timing of this realization, depends on the successful integration of Royal Adhesives. There is a significant degree of difficulty and management distraction inherent in the process of integrating an acquisition as sizable as Royal Adhesives. The process of integrating operations could cause an interruption of, or loss of momentum in, our Royal Adhesives’ activities. Members of our senior management may be required to devote considerable amounts of time to this integration process, which will decrease the time they will have to manage our company, service existing customers, attract new customers and develop new products or strategies. If senior management is not able to effectively manage the integration process, or if any significant business activities are interrupted as a result of the integration process, our business could suffer. There can be no assurance that we will successfully or cost-effectively integrate Royal Adhesives. The failure to do so could have a material adverse effect on our business, financial condition or results of operations. Even if we are able to integrate Royal Adhesives successfully, this integration may not result in the realization of the full benefits of the growth opportunities and cost synergies that we currently expect from this integration, and we cannot guarantee that these benefits will be achieved within anticipated timeframes or at all. For example, we may not be able to eliminate duplicative costs. Moreover, we may incur substantial expenses in connection with the integration of Royal Adhesives. While it is anticipated that certain expenses will be incurred to achieve cost synergies, such expenses are difficult to estimate accurately, and may exceed current estimates. Accordingly, the benefits from the acquisition may be offset by costs incurred to, or delays in, integrating the businesses. The debt incurred in connection with the Royal Adhesives acquisition could have a negative impact on our liquidity or restrict our activities. subject us to higher levels of indebtedness than our competitors, which may cause a competitive disadvantage and may reduce our flexibility in responding to increased competition. In addition, the restrictive covenants require us to maintain specified financial ratios and satisfy other financial condition tests. Our ability to meet those financial ratios and tests will depend on our ongoing financial and operating performance, which, in turn, will be subject to economic conditions and to financial, market and competitive factors, many of which are beyond our control. A breach of any of these covenants could result in a default under the instruments governing our indebtedness. The impact of changing laws or regulations or the manner of interpretation or enforcement of existing laws or regulations could adversely impact our financial performance and restrict our ability to operate our business or execute our strategies. New laws or regulations, or changes in existing laws or regulations or the manner of their interpretation or enforcement, could increase our cost of doing business and restrict our ability to operate our business or execute our strategies. In addition, compliance with laws and regulations is complicated by our substantial global footprint, which will require significant and additional resources to ensure compliance with applicable laws and regulations in the various countries where we conduct business. Our global operations expose us to trade and economic sanctions and other restrictions imposed by the U.S., the EU and other governments and organizations. The U.S. Departments of Justice, Commerce, State and Treasury and other federal agencies and authorities have a broad range of civil and criminal penalties they may seek to impose against corporations and individuals for violations of economic sanctions laws, export control laws, the Foreign Corrupt Practices Act (the “FCPA”) and other federal statutes and regulations, including those established by the Office of Foreign Assets Control (“OFAC”). Under these laws and regulations, as well as other anti-corruption laws, anti-money-laundering laws, export control laws, customs laws, sanctions laws and other laws governing our operations, various government agencies may require export licenses, may seek to impose modifications to business practices, including cessation of business activities in sanctioned countries or with sanctioned persons or entities and modifications to compliance programs, which may increase compliance costs, and may subject us to fines, penalties and other sanctions. A violation of these laws, regulations, policies or procedures could adversely impact our business, results of operations and financial condition. Although we have implemented policies and procedures in these areas, we cannot assure you that our policies and procedures are sufficient or that directors, officers, employees, representatives, manufacturers, suppliers and agents have not engaged and will not engage in conduct in violation of such policies and procedures. We have lawsuits and claims against us with uncertain outcomes. Our operations from time to time are parties to or targets of lawsuits, claims, investigations and proceedings, including product liability, personal injury, asbestos, patent and intellectual property, commercial, contract, environmental, antitrust, health and safety, and employment matters, which are handled and defended in the ordinary course of business. The results of any future litigation or settlement of such lawsuits and claims are inherently unpredictable, but such outcomes could be adverse and material in amount. See Item 3. Legal Proceedings for a discussion of current litigation. Costs and expenses resulting from compliance with environmental laws and regulations may negatively impact our operations and financial results. We are subject to numerous environmental laws and regulations that impose various environmental controls on us or otherwise relate to environmental protection, the sale and export of certain chemicals or hazardous materials, and various health and safety matters. The costs of complying with these laws and regulations can be significant and may increase as applicable requirements and their enforcement become more stringent and new rules are implemented. Adverse developments and/or periodic settlements could negatively impact our results of operations and cash flows. See Item 3. Legal Proceedings for a discussion of current environmental matters. We are subject to income tax laws and regulations in the United States and various foreign jurisdictions. Significant judgment is required in evaluating and estimating our provision and accruals for these taxes. Our income tax liabilities are dependent upon the location of earnings among these different jurisdictions. Our income tax provision and income tax liabilities could be adversely affected by the jurisdictional mix of earnings, changes in valuation of deferred tax assets and liabilities and changes in tax laws and regulations. In the ordinary course of our business, we are also subject to continuous examinations of our income tax returns by tax authorities. Although we believe our tax estimates are reasonable, the final results of any tax examination or related litigation could be materially different from our related historical income tax provisions and accruals. Adverse developments in an audit, examination or litigation related to previously filed tax returns, or in the relevant jurisdiction’s tax laws, regulations, administrative practices, principles and interpretations could have a material effect on our results of operations and cash flows in the period or periods for which that development occurs, as well as for prior and subsequent periods. On December 22, 2017, the President of the United States signed into law H.R. 1, originally known as the “Tax Cuts and Jobs Act”, hereafter referred to as “U.S. Tax Reform”. Since the passing of U.S. Tax Reform, additional guidance in the form of notices and proposed regulations which interpret various aspects of U.S. Tax Reform have been issued. As of the filing of this document, additional guidance is expected. Changes could be made to the proposed regulations as they become finalized, future legislation could be enacted, more regulations and notices could be issued, all of which may impact our financial results. We will continue to monitor all of these changes and will reflect the impact as appropriate in future financial statements. Many state and local tax jurisdictions are still determining how they will interpret elements of U.S. Tax Reform. Final state and local governments’ conformity, legislation and guidance relating to U.S. Tax Reform may impact our financial results. From time to time, we become aware of compliance matters relating to, or receive notices from, federal, state or local entities regarding possible or alleged violations of environmental, health or safety laws and regulations. We review the circumstances of each individual site, considering the number of parties involved, the level of potential liability or our contribution relative to the other parties, the nature and magnitude of the hazardous substances involved, the method and extent of remediation, the estimated legal and consulting expense with respect to each site and the time period over which any costs would likely be incurred. Also, from time to time, we are identified as a potentially responsible party (“PRP”) under the Comprehensive Environmental Response, Compensation and Liability Act (“CERCLA”) and/or similar state laws that impose liability for costs relating to the clean up of contamination resulting from past spills, disposal or other release of hazardous substances. We are also subject to similar laws in some of the countries where current and former facilities are located. Our environmental, health and safety department monitors compliance with applicable laws on a global basis. To the extent we can reasonably estimate the amount of our probable liabilities for environmental matters, we establish a financial provision. Currently, we are involved in various environmental investigations, clean up activities and administrative proceedings and lawsuits. In particular, we are currently deemed a PRP in conjunction with numerous other parties, in a number of government enforcement actions associated with landfills and/or hazardous waste sites. As a PRP, we may be required to pay a share of the costs of investigation and clean up of these sites. We are engaged in environmental remediation and monitoring efforts at a number of current and former operating facilities. As of December 1, 2018, we accrued $10.7 million, which represents our best estimate of probable liabilities with respect to environmental matters. Of the amount accrued, $4.8 million is attributable to a facility we own in Simpsonville, South Carolina as a result of our Royal Adhesives acquisition that is a designated site under CERCLA. It is reasonably possible that we may have additional liabilities related to these known environmental matters. However, the full extent of our future liability for environmental matters is difficult to predict because of uncertainty as to the cost of investigation and clean up of the sites, our responsibility for such hazardous substances and the number of and financial condition of other potentially responsible parties. While uncertainties exist with respect to the amounts and timing of the ultimate environmental liabilities, based on currently available information, we have concluded that these matters, individually or in the aggregate, will not have a material adverse effect on our results of operations, financial condition or cash flow. However, adverse developments and/or periodic settlements could negatively impact the results of operations or cash flows in one or more future periods. From time to time and in the ordinary course of business, we are a party to, or a target of, lawsuits, claims, investigations and proceedings, including product liability, personal injury, contract, patent and intellectual property, environmental, health and safety, tax and employment matters. While we are unable to predict the outcome of these matters, we have concluded, based upon currently available information, that the ultimate resolution of any pending matter, individually or in the aggregate, including the asbestos litigation described in the following paragraphs, will not have a material adverse effect on our results of operations, financial condition or cash flow. We have been named as a defendant in lawsuits in which plaintiffs have alleged injury due to products containing asbestos manufactured more than 30 years ago. The plaintiffs generally bring these lawsuits against multiple defendants and seek damages (both actual and punitive) in very large amounts. In many cases, plaintiffs are unable to demonstrate that they have suffered any compensable injuries or that the injuries suffered were the result of exposure to products manufactured by us. We are typically dismissed as a defendant in such cases without payment. If the plaintiff presents evidence indicating that compensable injury occurred as a result of exposure to our products, the case is generally settled for an amount that reflects the seriousness of the injury, the length, intensity and character of exposure to products containing asbestos, the number and solvency of other defendants in the case, and the jurisdiction in which the case has been brought. A significant portion of the defense costs and settlements in asbestos-related litigation is paid by third parties, including indemnification pursuant to the provisions of a 1976 agreement under which we acquired a business from a third party. Currently, this third party is defending and paying settlement amounts, under a reservation of rights, in most of the asbestos cases tendered to the third party. In addition to the indemnification arrangements with third parties, we have insurance policies that generally provide coverage for asbestos liabilities (including defense costs). Historically, insurers have paid a significant portion of our defense costs and settlements in asbestos-related litigation. However, certain of our insurers are insolvent. We have entered into cost-sharing agreements with our insurers that provide for the allocation of defense costs and settlements and judgments in asbestos-related lawsuits. These agreements require, among other things, that we fund a share of settlements and judgments allocable to years in which the responsible insurer is insolvent. We do not believe that it would be meaningful to disclose the aggregate number of asbestos-related lawsuits filed against us because relatively few of these lawsuits are known to involve exposure to asbestos-containing products that we manufactured. Rather, we believe it is more meaningful to disclose the number of lawsuits that are settled and result in a payment to the plaintiff. To the extent we can reasonably estimate the amount of our probable liabilities for pending asbestos-related claims, we establish a financial provision and a corresponding receivable for insurance recoveries. Based on currently available information, we have concluded that the resolution of any pending matter, including asbestos-related litigation, individually or in the aggregate, will not have a material adverse effect on our results of operations, financial condition or cash flow. However, adverse developments and/or periodic settlements could negatively impact the results of operations or cash flows in one or more future periods. During 2018, we retained legal counsel to conduct an internal investigation of the possible resale of our hygiene products into Iran by certain customers of our subsidiaries in Turkey (beginning in 2011) and India (beginning in 2014), in possible violation of the economic sanctions against Iran administered by OFAC and our compliance policy. The sales to these customers represented less than one percent of our net revenue in each of our last three fiscal years. The sales to the customers who were reselling our products into Iran ceased during fiscal year 2018 and we do not currently conduct any business in Iran. In January 2018, we voluntarily contacted OFAC to advise it of this internal investigation and our intention to cooperate fully with OFAC and, in September 2018, we submitted the results and findings of our investigation to OFAC. We have not yet received a response from OFAC. At this time, we cannot predict the outcome or effect of the investigation, however, based on the results of our investigation to date, we believe we could incur penalties ranging from zero to $10.0 million. Our common stock is traded on the New York Stock Exchange under the symbol FUL. As of January 22, 2019, there were 1,490 common shareholders of record for our common stock. 1 The total number of shares purchased include shares withheld to satisfy employees’ withholding taxes upon vesting of restricted stock. On April 6, 2017, the Board of Directors authorized a new share repurchase program of up to $200.0 million of our outstanding common shares. Under the program, we are authorized to repurchase shares for cash on the open market, from time to time, in privately negotiated transactions or block transactions, or through an accelerated repurchase agreement. The timing of such repurchases is dependent on price, market conditions and applicable regulatory requirements. Upon repurchase of the shares, we reduced our common stock for the par value of the shares with the excess being applied against additional paid in capital. This authorization replaces the September 30, 2010 authorization to repurchase shares. 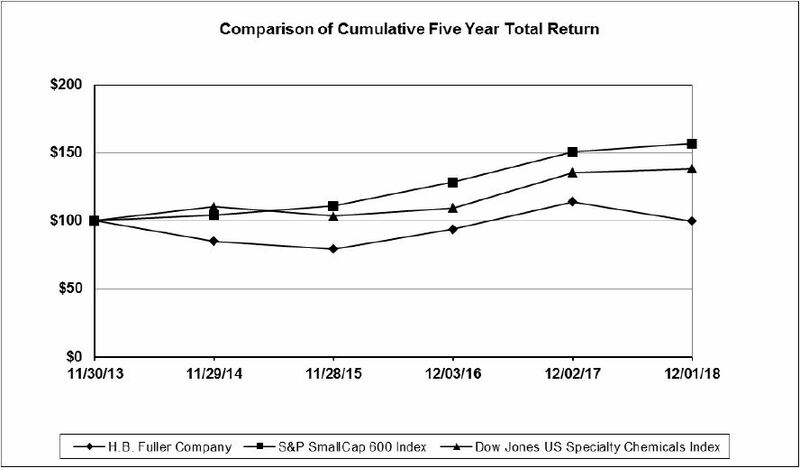 The line graph below compares the cumulative total shareholder return on our common stock for the last five fiscal years with cumulative total return on the S&P Small Cap 600 Index and Dow Jones U.S. Specialty Chemicals Index. This graph assumes a $100 investment in each of H.B. Fuller, the S&P Small Cap 600 Index and the Dow Jones U.S. Specialty Chemicals Index at the close of trading on November 30, 2013, and also assumes the reinvestment of all dividends. The table that follows presents selected financial data for each of the last five years from the Company’s consolidated financial statements and should be read in conjunction with the Company’s Consolidated Financial Statements and the related Notes and with Management’s Discussion and Analysis of Financial Condition and Results of Operations included elsewhere in this Annual Report on Form 10-K. The selected financial data set forth below as of December 1, 2018 and December 2, 2017 and for the years ended December 1, 2018, December 2, 2017 and December 3, 2016 are derived from our audited financial statements included in this Annual Report on Form 10-K. All other selected financial data set forth below is derived from our audited financial statements not included in this Annual Report on Form 10-K.
1 2016, 2015 and 2014 include after-tax charges of $(0.2) million, $4.7 million and $45.2 million, respectively, related to special charges, net. 2 2016 contained 53 weeks. 3 Amounts have been adjusted retroactively for discontinued operations. 4 Amounts have been adjusted retrospectively for the change in accounting principle as discussed in Item 7. 5 Book value is calculated by dividing total H.B. Fuller stockholders' equity by the number of common stock shares outstanding as of our fiscal year end. H.B. Fuller Company is a global formulator, manufacturer and marketer of adhesives and other specialty chemical products. For the year ended December 2, 2017, we had six reportable segments: Americas Adhesives, EIMEA, Asia Pacific, Construction Adhesives, Engineering Adhesives and Royal Adhesives. As of the beginning of fiscal 2018, in connection with the integration of the operations of Royal Adhesives with the Company’s other segments, we modified our operating segment structure by allocating the Royal Adhesives segment into each of the five other segments. We began reporting results in five segments for the quarter ended March 3, 2018: Americas Adhesives, EIMEA, Asia Pacific, Construction Adhesives and Engineering Adhesives. The Americas Adhesives, EIMEA and Asia Pacific operating segments manufacture and supply adhesives products in the assembly, packaging, converting, nonwoven and hygiene, performance wood, insulating glass, flooring, textile, flexible packaging, graphic arts and envelope markets. The Construction Adhesives operating segment provides floor preparation, grouts and mortars for tile setting, and adhesives for soft flooring, and pressure-sensitive adhesives, tapes and sealants for the commercial roofing industry as well as sealants and related products for heating, ventilation and air conditioning installations. The Engineering Adhesives operating segment provides high-performance adhesives to the transportation, electronics, medical, clean energy, aerospace and defense, appliance and heavy machinery markets. We purchase thousands of raw materials, the majority of which are petroleum/natural gas derivatives. The price of these derivatives impacts the cost of our raw materials. However, the supply of and demand for key raw materials has a greater impact on our costs. As demand increases in high-growth areas, the supply of key raw materials may tighten, resulting in certain materials being put on allocation. Natural disasters, such as hurricanes, also can have an impact as key raw material producers are shut down for extended periods of time. We continually monitor capacity utilization figures, market supply and demand conditions, feedstock costs and inventory levels, as well as derivative and intermediate prices, which affect our raw materials. With approximately 75 percent of our cost of sales accounted for by raw materials, our financial results are extremely sensitive to changing costs in this area. The pace of economic growth directly impacts certain industries to which we supply products. For example, adhesives-related revenues from durable goods customers in areas such as appliances, furniture and other woodworking applications tend to fluctuate with the overall economic activity. In business components such as Construction Adhesives and insulating glass, revenues tend to move with more specific economic indicators such as housing starts and other construction-related activity. The movement of foreign currency exchange rates as compared to the U.S. dollar impacts the translation of the foreign entities’ financial statements into U.S. dollars. As foreign currencies weaken against the U.S. dollar, our revenues and costs decrease as the foreign currency-denominated financial statements translate into fewer U.S. dollars. The fluctuations of the Euro and the Chinese renminbi against the U.S. dollar have the largest impact on our financial results as compared to all other currencies. In 2018, currency fluctuations had a negative impact on net revenue of approximately $2.0 million as compared to 2017. Net revenue increased 31.9 percent from 2017 primarily driven by a 28.3 percent increase due to acquisitions, a 3.4 percent increase in product pricing, and a 0.6 percent increase due to favorable sales mix. Positive drivers of growth were partially offset by a 0.3 percent decrease in sales volume and a 0.1 percent decrease due to currency fluctuations. Gross profit margin increased to 27.5 percent from 26.2 percent in 2018 primarily due to favorable product pricing, the impact of the Royal Adhesives acquisition and lower restructuring plan costs. Positive drivers of growth were partially offset by higher raw material costs. Cash flow generated by operating activities was $253.3 million in 2018 as compared to $140.8 million in 2017 and $195.7 million in 2016. Our total year constant currency sales growth, which we define as the combined variances from sales volume, product pricing, sales mix and business acquisitions, increased 32.0 percent for 2018 compared to 2017. In 2018, our diluted earnings per share was $3.29 compared to $1.15 in 2017 and $2.37 in 2016. The higher earnings per share in 2018 compared to 2017 was due to higher net revenue, lower transaction costs related to acquisitions, and one time discrete items related to U.S. Tax Reform, which were partially offset by higher operating expenses mainly due to the impact of acquired businesses and higher interest expense due to higher U.S. debt balances at higher interest rates from the issuance of new debt in 2017. The lower earnings per share in 2017 compared to 2016 was due to an increase in transaction costs related to acquisitions, including make-whole costs associated with the early repayment of certain outstanding debt obligations, and the implementation of the 2017 Restructuring Plan. In the fourth quarter of 2018, we elected to change our method of accounting for certain inventories in the United States within the Company’s Americas Adhesives and Construction Adhesives segments from the last-in, first-out method (“LIFO”) to weighted-average cost. We have retrospectively adjusted the Consolidated Financial Statements for all periods presented to reflect this change. In December 2012, our Board of Directors approved a multi-year project to replace and enhance our existing core information technology platforms. The scope for this project includes most of the basic transaction processing for the company including customer orders, procurement, manufacturing, and financial reporting. The project envisions harmonized business processes for all of our operating segments supported with one standard software configuration. The execution of this project, which we refer to as Project ONE, is being supported by internal resources and consulting services. The North America adhesives business went live in 2014. In 2017, we began the Project ONE implementation in our Latin America adhesives business, and implementation for all countries, with the exception of Brazil, has been completed as of the end of 2018. During 2019 and beyond, we will continue implementation in North America, EIMEA (Europe, India, Middle East and Africa) and Asia Pacific. Total expenditures for Project ONE are estimated to be $195 to $210 million, of which 50-55% is expected to be capital expenditures. Our total project-to-date expenditures are approximately $73 million, of which approximately $38 million are capital expenditures. Given the complexity of the implementation, the total investment to complete the project may exceed our estimate. During the first quarter of 2018, we approved a restructuring plan consisting of consolidation plans, organizational changes and other actions related to the integration of the operations of Royal Adhesives with the operations of the Company (the “Royal Adhesives Restructuring Plan”). In implementing the Royal Adhesives Restructuring Plan, we expect to incur costs of approximately $20.0 million, which includes (i) cash expenditures of approximately $12.0 million for severance and related employee costs globally and (ii) other costs of approximately $8.0 million related to the optimization of production facilities, streamlining of processes and accelerated depreciation of long-lived assets. Approximately $14.0 million of the costs are expected to be cash costs. For the year ending December 1, 2018, we incurred costs of $6.7 million under this plan. The Royal Adhesives Restructuring Plan was implemented in the first quarter of 2018 and is currently expected to be completed by the end of fiscal year 2020. During the first quarter of 2017, we approved a restructuring plan (the “2017 Restructuring Plan”) related to organizational changes and other actions to optimize operations. In implementing the 2017 Restructuring Plan, we incurred costs of $20.2 million as of December 1, 2018 which included cash expenditures of approximately $11.3 million for severance and related employee costs globally and $8.9 million related to the optimization of production facilities, streamlining of processes and accelerated depreciation of long-lived assets. Approximately $15.8 million of the costs were cash costs. The 2017 Restructuring Plan is substantially complete. On December 22, 2017, the President of the United States signed into law H.R. 1, originally known as the “Tax Cuts and Jobs Act”, hereafter referred to as “U.S. Tax Reform”. Since the passing of U.S. Tax Reform, additional guidance in the form of notices and proposed regulations which interpret various aspects of U.S. Tax Reform have been issued. As of the filing of this document, additional guidance is expected. Changes could be made to the proposed regulations as they become finalized, future legislation could be enacted, more regulations and notices could be issued, all of which may impact our financial results. We will continue to monitor all of these changes and will reflect the impact as appropriate in future financial statements. Many state and local tax jurisdictions are still determining how they will interpret elements of U.S. Tax Reform. Final state and local governments’ conformity and legislation or guidance relating to U.S. Tax Reform may impact our financial results. Given the varying effective dates of specific components of U.S. Tax Reform coupled with our fiscal year end, we will be required to consider additional elements of U.S. Tax Reform, including the significant changes related to taxation of international operations that we were not subject to during our fiscal year ended December 1, 2018. Such elements will be included for our fiscal year ended November 30, 2019. Management’s discussion and analysis of our results of operations and financial condition are based upon the Consolidated Financial Statements, which have been prepared in accordance with accounting principles generally accepted in the United States of America. The preparation of these financial statements requires us to make estimates and judgments that affect the reported amounts of assets, liabilities, revenues and expenses and related disclosure of contingent assets and liabilities. We believe the critical accounting policies and areas that require the most significant judgments and estimates to be used in the preparation of the Consolidated Financial Statements relate to pension and other postretirement plans; goodwill impairment; long-lived assets recoverability; valuation of product, environmental and other litigation liabilities; valuation of deferred tax assets and accuracy of tax contingencies; and valuation of acquired assets and liabilities. We sponsor defined-benefit pension plans in both the U.S. and non-U.S. entities. Also in the U.S., we sponsor other postretirement plans for health care and life insurance benefits. Expenses and liabilities for the pension plans and other postretirement plans are actuarially calculated. These calculations are based on our assumptions related to the discount rate, expected return on assets, projected salary increases and health care cost trend rates. Note 10 to the Consolidated Financial Statements includes disclosure of assumptions employed in these measurements for both the non-U.S. and U.S. plans. The discount rate assumption is determined using an actuarial yield curve approach, which results in a discount rate that reflects the characteristics of the plan. The approach identifies a broad population of corporate bonds that meet the quality and size criteria for the particular plan. We use this approach rather than a specific index that has a certain set of bonds that may or may not be representative of the characteristics of our particular plan. A higher discount rate reduces the present value of the pension obligations. The discount rate for the U.S. pension plan was 4.51 percent at December 1, 2018, as compared to 3.73 percent at December 2, 2017 and 4.10 percent at December 3, 2016. Net periodic pension cost for a given fiscal year is based on assumptions developed at the end of the previous fiscal year. A discount rate reduction of 0.5 percentage points at December 1, 2018 would decrease U.S. pension and other postretirement plan expense less than $0.1 million (pre-tax) in fiscal 2019. Discount rates for non-U.S. plans are determined in a manner consistent with the U.S. plans. The expected long-term rate of return on plan assets assumption for the U.S. pension plan was 7.75 percent in 2018, 2017 and 2016. Our expected long-term rate of return on U.S. plan assets was based on our target asset allocation assumption of 60 percent equities and 40 percent fixed-income. Management, in conjunction with our external financial advisors, determines the expected long-term rate of return on plan assets by considering the expected future returns and volatility levels for each asset class that are based on historical returns and forward looking observations. For 2018, the expected long-term rate of return on the target equities allocation was 8.25 percent and the expected long-term rate of return on the target fixed-income allocation was 5.6 percent. The total plan rate of return assumption included an estimate of the effect of diversification and the plan expense. For 2019, the expected long-term rate of return on assets will be 7.50 percent with an expected long-term rate of return on the target equities allocation of 8.2 percent and an expected long-term rate of return on target fixed-income allocation of 5.6 percent. A change of 0.5 percentage points for the expected return on assets assumption would impact U.S. net pension and other postretirement plan expense by approximately $2.1 million (pre-tax). Management, in conjunction with our external financial advisors, uses the actual historical rates of return of the asset categories to assess the reasonableness of the expected long-term rate of return on plan assets. The most recent 10-year and 20-year historical equity returns are shown in the table below. Our expected rate of return on our total portfolio is consistent with the historical patterns observed over longer time frames. * Beginning in 2006, our target allocation migrated from 100 percent equities to our current allocation of 60 percent equities and 40 percent fixed-income. The historical actual rate of return for the fixed income of 7.0 percent is since inception (12 years, 11 months). The expected long-term rate of return on plan assets assumption for non-U.S. pension plans was a weighted-average of 6.20 percent in 2018 compared to 6.21 percent in 2017 and 6.20 percent in 2016. The expected long-term rate of return on plan assets assumption used in each non-U.S. plan is determined on a plan-by-plan basis for each local jurisdiction and is based on expected future returns for the investment mix of assets currently in the portfolio for that plan. Management, in conjunction with our external financial advisors, develops expected rates of return for each plan, considers expected long-term returns for each asset category in the plan, reviews expectations for inflation for each local jurisdiction, and estimates the effect of active management of the plan’s assets. Our largest non-U.S. pension plans are in the United Kingdom and Germany. The expected long-term rate of return on plan assets for the United Kingdom was 6.75 percent and the expected long-term rate of return on plan assets for Germany was 5.75 percent. Management, in conjunction with our external financial advisors, uses actual historical returns of the asset portfolio to assess the reasonableness of the expected rate of return for each plan. The projected salary increase assumption is based on historic trends and comparisons to the external market. Higher rates of increase result in higher pension expenses. As this rate is also a long-term expected rate, it is less likely to change on an annual basis. In the U.S., we have used the rate of 4.50 percent for 2018, 2017 and 2016. Benefits under the U.S. Pension Plan were locked-in as of May 31, 2011 and no longer include compensation increases. The 4.50 percent rate is for the supplemental executive retirement plan only. Projected salary increase assumptions for non-U.S. plans are determined in a manner consistent with the U.S. plans. Goodwill is the excess of cost of an acquired entity over the amounts assigned to assets acquired and liabilities assumed in a purchase business combination. Goodwill is allocated to our reporting units, which are our operating segments or one level below our operating segments (the component level). Reporting units are determined by the discrete financial information available for the component and whether it is regularly reviewed by segment management. Components are aggregated into a single reporting unit if they share similar economic characteristics. Our reporting units are as follows: Americas Adhesives, EIMEA, Asia Pacific, Flooring, Roofing, Specialty Construction, Engineering Adhesives and Tonsan. We evaluate our goodwill for impairment annually as of the end of our third quarter or earlier upon the occurrence of substantive unfavorable changes in economic conditions, industry trends, costs, cash flows, or ongoing declines in market capitalization. For fiscal 2018, we performed an initial quantitative goodwill impairment test as of the end of the third quarter which resulted in no indicators of impairment for any of our reporting units. However, upon the decrease of our stock price and management’s reassessment of its long-term business plan during the fourth quarter of 2018, we updated our quantitative goodwill impairment test as of December 1, 2018. The quantitative impairment test requires judgment, including the identification of reporting units, the assignment of assets, liabilities and goodwill to reporting units, and the determination of fair value of each reporting unit. The impairment test requires the comparison of the fair value of each reporting unit with its carrying amount, including goodwill. In performing the impairment test, we determined the fair value of our reporting units by using discounted cash flow (“DCF”) analyses. Determining fair value requires the Company to make judgments about appropriate discount rates, perpetual growth rates and the amount and timing of expected future cash flows. The cash flows employed in the DCF analysis for each reporting unit are based on the reporting unit's budget, long-term business plan, and recent operating performance. Discount rate assumptions are based on an assessment of the risk inherent in the future cash flows of the respective reporting unit and market conditions. Given the inherent uncertainty in determining the assumptions underlying a DCF analysis, actual results may differ from those used in our valuations. In assessing the reasonableness of the determined fair values, we also reconciled the aggregate determined fair value of the Company to the Company's market capitalization, which, at the date of our fourth quarter 2018 impairment test, included an 11% control premium. For the fourth quarter 2018 test, the fair value of the reporting units exceeded the respective carrying values by 16% to 122% ("headroom"). Significant assumptions used in the DCF included long-term growth rates and discount rates that ranged from 9.0% to 10.8%. An increase in the discount and decrease in the long-term growth rates of 0.5% would result in the fair value of the reporting units exceeding their respective carrying values by 5% to 104%. The Roofing reporting unit, which had headroom of 18%, and EIMEA reporting unit, which had headroom of 16%, were the only reporting units with fair value in excess of carrying value of less than 20%. As of December 1, 2018, the carrying value of goodwill assigned to the Roofing and EIMEA reporting units were $175.0 and $190.2 million, respectively. Management will continue to monitor these reporting units for changes in the business environment that could impact recoverability. The recoverability of goodwill is dependent upon the continued growth of cash flows from our business activities. If the economy or business environment falter and we are unable to achieve our assumed revenue growth rates or profit margin percentages, our projections used would need to be remeasured, which could impact the carrying value of our goodwill in one or more of our reporting units. Most significantly, for our Roofing reporting unit, a decrease in the planned volume revenue growth would negatively impact the fair value of the reporting unit and the calculation of excess carrying value. For our EIMEA reporting unit, not achieving cost savings due to plant consolidation efforts currently underway would negatively impact the fair value of the reporting unit and the calculation of excess carrying value. See Note 5 to the Consolidated Financial Statements for further information regarding goodwill. The assessment of the recoverability of long-lived assets reflects our assumptions and estimates. Factors that we must estimate when performing impairment tests include sales volume, prices, inflation, currency exchange rates, tax rates and capital spending. Significant judgment is involved in estimating these factors, and they include inherent uncertainties. The measurement of the recoverability of these assets is dependent upon the accuracy of the assumptions used in making these estimates and how the estimates compare to the eventual future operating performance of the specific businesses to which the assets are attributed. Judgments made by us include the expected useful lives of long-lived assets. The ability to realize undiscounted cash flows in excess of the carrying amounts of such assets is affected by factors such as the ongoing maintenance and improvement of the assets, changes in economic conditions and changes in operating performance. As disclosed in Item 3. Legal Proceedings and in Note 1 and Note 14 to the Consolidated Financial Statements, we are subject to various claims, lawsuits and other legal proceedings. Reserves for loss contingencies associated with these matters are established when it is determined that a liability is probable and the amount can be reasonably estimated. The assessment of the probable liabilities is based on the facts and circumstances known at the time that the financial statements are being prepared. For cases in which it is determined that a liability is probable but only a range for the potential loss exists, the minimum amount of the range is recorded and subsequently adjusted as better information becomes available. For cases in which insurance coverage is available, the gross amount of the estimated liabilities is accrued, and a receivable is recorded for any probable estimated insurance recoveries. A discussion of environmental, product and other litigation liabilities is disclosed in Item 3. Legal Proceedings and Note 14 to the Consolidated Financial Statements. Based upon currently available facts, we do not believe that the ultimate resolution of any pending legal proceeding, individually or in the aggregate, will have a material adverse effect on our long-term financial condition. However, adverse developments and/or periodic settlements could negatively affect our results of operations or cash flows in one or more future quarters. As part of the process of preparing the Consolidated Financial Statements, we are required to estimate income taxes in each of the jurisdictions in which we operate. The process involves estimating actual current tax expense along with assessing temporary differences resulting from differing treatment of items for book and tax purposes. These temporary differences result in deferred tax assets and liabilities, which are included in the Consolidated Balance Sheets. We record a valuation allowance to reduce our deferred tax assets to the amount that is more-likely-than-not to be realized. We have considered future taxable income and ongoing tax planning strategies in assessing the need for the valuation allowance. Increases in the valuation allowance result in additional expense to be reflected within the tax provision in the Consolidated Statements of Income. As of December 1, 2018, the valuation allowance to reduce deferred tax assets totaled $14.1 million. We recognize tax benefits for tax positions for which it is more-likely-than-not that the tax position will be sustained by the applicable tax authority at the largest amount of tax benefit that is greater than fifty percent likely of being realized upon ultimate settlement. We do not recognize a financial statement benefit for a tax position that does not meet the more-likely-than-not threshold. We believe that our liabilities for income taxes reflect the most likely outcome. It is difficult to predict the final outcome or the timing of the resolution of any particular tax position. Future changes in judgment related to the resolution of tax positions will impact earnings in the quarter of such change. We adjust our income tax liabilities related to tax positions in light of changing facts and circumstances. Settlement with respect to a tax position would usually require cash. Based upon our analysis of tax positions taken on prior year returns and expected tax positions to be taken for the current year tax returns, we have identified gross uncertain tax positions of $8.4 million as of December 1, 2018. We have not recorded U.S. deferred income taxes for certain of our non-U.S. subsidiaries undistributed earnings as such amounts are intended to be indefinitely reinvested outside of the U.S. Should we change our business strategies related to these non-U.S. subsidiaries, additional U.S. tax liabilities could be incurred. It is not practical to estimate the amount of these additional tax liabilities. See Note 11 to the Consolidated Financial Statements for further information on income tax accounting. We complete valuation procedures and record the resulting fair value of the acquired assets and assumed liabilities based upon the valuation of the business enterprise and the tangible and intangible assets acquired. Enterprise value allocation methodology requires management to make assumptions and apply judgment to estimate the fair value of assets acquired and liabilities assumed. If estimates or assumptions used to complete the enterprise valuation and estimates of the fair value of the acquired assets and assumed liabilities significantly differed from assumptions made, the resulting difference could materially affect the fair value of net assets. The calculation of the fair value of the tangible assets, including property, plant and equipment, utilizes the cost approach, which computes the cost to replace the asset, less accrued depreciation resulting from physical deterioration, functional obsolescence and external obsolescence. The calculation of the fair value of the identified intangible assets are determined using cash flow models following the income approach or a discounted market-based methodology approach. Significant inputs include estimated revenue growth rates, gross margins, operating expenses, and estimated attrition, royalty and discount rates. Goodwill is recorded as the difference in the fair value of the acquired assets and assumed liabilities and the purchase price. Constant currency growth was 32.0 percent in 2018 compared to 2017. The 32.0 percent constant currency growth in 2018 was driven by 71.4 percent growth in Construction Adhesives, 57.1 percent growth in Engineering Adhesives, 29.9 percent growth in EIMEA, 21.2 percent growth in Americas Adhesives and 5.1 percent growth in Asia Pacific. Constant currency growth in 2018 includes 28.3 percent growth attributable to the acquisition of Royal Adhesives and Adecol. The negative 0.1 percent currency impact was primarily driven by a weaker Brazilian real, Argentinian peso, Australian dollar, Canadian dollar and Turkish lira offset by a stronger Mexican peso, Chinese renminbi and Euro compared to the U.S. dollar. Constant currency growth was 12.3 percent in 2017 compared to 2016. The inclusion of a 53rd week in 2016 negatively impacted 2017 constant currency sales growth by approximately 2.0 percent. The 12.3 percent constant currency growth in 2017 was driven by 24.2 percent growth in Engineering Adhesives, 12.6 percent growth in Americas Adhesives, 9.5 percent growth in Asia Pacific, 4.3 percent growth in EIMEA and 1.5 percent growth in Construction Adhesives. Constant currency growth in 2017 includes 3.7 percent growth attributable to the acquisition of Royal Adhesives. The negative 2.2 percent currency impact was primarily driven by a weaker Egyptian pound, Turkish lira, Chinese renminbi, Argentinian peso, Mexican peso and Malaysian ringgit partially offset by a stronger Euro, Indian rupee and Australian dollar compared to the U.S. dollar. Raw material costs as a percentage of net revenue decreased 130 basis points in 2018 compared to 2017 due to an increase in product pricing and the impact of the Royal Adhesives acquisition. Other manufacturing costs as a percentage of net revenue was flat compared to 2017. As a result, cost of sales as a percentage of net revenue decreased 130 basis points compared to 2017. Raw material costs as a percentage of net revenue increased 240 basis points in 2017 compared to 2016 due to higher raw material costs and the impact of acquired businesses including the inventory step up related to our recent acquisitions. Other manufacturing costs as a percentage of revenue increased 40 basis points compared to 2016 driven primarily by the impact of acquired businesses and the implementation of the 2017 Restructuring Plan. As a result, cost of sales as a percentage of net revenue increased 270 basis points compared to 2016. Gross profit in 2018 increased $231.8 million compared to 2017 and gross profit margin increased 130 basis points. The increase in gross profit margin was primarily due to favorable product pricing and the impact of the Royal Adhesives acquisition and lower restructuring plan costs. Gross profit in 2017 decreased $0.7 million compared to 2016 and gross profit margin decreased 270 basis points. The decrease in gross profit margin was primarily due to higher raw material costs, the impact of acquired businesses and the implementation of the 2017 Restructuring Plan. Selling, general and administration (“SG&A”) expenses for 2018 increased $105.1 million or 22.0 percent compared to 2017. The increase is mainly due to the impact of acquired businesses and the impact of unfavorable foreign currency exchange rates on spending outside the U.S.
SG&A expenses for 2017 increased $69.4 million or 17.0 percent compared to 2016. The increase is mainly due to the impact of acquired businesses, transaction costs related to acquisitions and higher variable compensation, partially offset by lower expenses related to general spending reductions and the impact of favorable foreign currency exchange rates on spending outside the U.S.
Acquisition and transformation related costs of $0.2 million for the year ended December 3, 2016 include costs related to organization consulting, financial advisory and legal services necessary to integrate the industrial adhesives business we acquired in March 2012 into our existing operating segments. During the year ended December 3, 2016, we incurred cash facility exit costs of $1.3 million, non-cash facility exit costs of $1.7 million and other incremental transformation related costs of $0.2 million. Also included in facility exit costs for 2016 is a $3.6 million gain on the sale of our production facility located in Wels, Austria. Other income (expense), net includes foreign currency transaction losses of $4.5 million, $2.4 million and $9.5 million in 2018, 2017 and 2016, respectively. Gain (loss) on disposal of fixed assets was $3.1 million, nil and ($0.8) million in 2018, 2017 and 2016, respectively. Other income (expense), net for 2017 also included $25.5 million of expense related to make-whole costs associated with the early repayment of certain outstanding debt obligations which were refinanced upon entering into the Term Loan B Credit Agreement (as described in Note 6 to our Consolidated Financial Statements). Interest expense was $111.0 million, $43.7 million and $27.4 million for 2018, 2017 and 2016, respectively. The higher interest expense in 2018 compared to 2017 was due primarily to higher U.S. debt balances at higher interest rates from the issuance of our 4.000% Notes and higher LIBOR rates on floating rate debt held in the U.S. The higher interest expense in 2017 compared to 2016 was due to higher U.S. debt balances from the issuance of our Term Loan B Credit Agreement and the Public Notes and the write-off of capitalized debt issuance costs on repaid debt facilities. We capitalized interest of $0.3 million, $0.3 million and $0.8 million in 2018, 2017 and 2016, respectively. Interest income was $11.7 million, $3.9 million and $2.0 million in 2018, 2017 and 2016, respectively. Interest income in 2018 was higher due to our cross-currency swap cash flow hedges that were entered into at the end of 2017 in conjunction with the Royal Adhesives acquisition. The income tax benefit in 2018 of $6.4 million includes $49.0 million of discrete tax benefits in both the U.S. and foreign jurisdictions, primarily related to the impact of U.S. Tax Reform. Income tax expense in 2017 of $9.8 million includes $4.1 million of discrete tax benefits in both the U.S. and foreign jurisdictions, primarily related to the release of the valuation allowance in Brazil in conjunction with the Adecol acquisition. Income tax expense in 2016 of $48.9 million included $2.6 million of discrete tax benefits in both the U.S. and foreign jurisdictions. Excluding discrete items, the overall effective tax rate increased by 4.2 percentage points in 2018 as compared to 2017 and decreased by 8.5 percentage points in 2017 as compared to 2016. The increase in the tax rate is principally due to an increase in the effective rate outside the U.S. due to a change in the geographic mix of pre-tax earnings, as well as withholding tax expense in foreign jurisdictions. The income from equity method investments relates to our 50 percent ownership of the Sekisui-Fuller joint venture in Japan. The lower income for 2018 compared to 2017 relates to lower net income in our joint venture. The higher income for 2017 compared to 2016 relates to higher net income in our joint venture. The net income attributable to non-controlling interests related to the redeemable non-controlling interest in H.B. Fuller Kimya Sanayi Ticaret A.S. (HBF Kimya). During fiscal 2017, we purchased the remaining shares from the non-controlling shareholder. Net income attributable to H.B. Fuller was $171.2 million in 2018 compared to $59.4 million in 2017 and $121.7 million in 2016. Diluted earnings per share was $3.29 per share in 2018, $1.15 per share for 2017 and $2.37 per share for 2016. We are required to report segment information in the same way that we internally organize our business for assessing performance and making decisions regarding allocation of resources. For segment evaluation by the chief operating decision maker, segment operating income is defined as gross profit less SG&A expenses. Segment operating income excludes special charges, net. Inter-segment revenues are recorded at cost plus a markup for administrative costs. Corporate expenses are fully allocated to each operating segment. For the year ended December 2, 2017, we had six reportable segments: Americas Adhesives, EIMEA, Asia Pacific, Construction Adhesives, Engineering Adhesives and Royal Adhesives. As of the beginning of fiscal 2018, in connection with the integration of the operations of Royal Adhesives with the Company’s other segments, we modified our operating segment structure by allocating the Royal Adhesives segment into each of the five other segments. We began reporting results in five segments for the quarter ended March 3, 2018: Americas Adhesives, EIMEA, Asia Pacific, Construction Adhesives and Engineering Adhesives. The tables below provide certain information regarding the net revenue and segment operating income (loss) of each of our operating segments. The following table provides a reconciliation of segment operating income to income before income taxes and income from equity method investments, as reported in the Consolidated Statements of Income. Net revenue increased 21.2 percent in 2018 compared to 2017. The 23.9 percent increase in constant currency growth was attributable to an 18.7 percent increase in sales volume, including a 22.1 percent increase due to the Royal Adhesives, Adecol and Wisdom acquisitions, a 3.8 percent increase in product pricing and a 1.4 percent increase in sales mix. The 2.7 negative currency effect was primarily due to the weaker Brazilian real and Argentinian peso compared to the U.S. dollar. As a percentage of net revenue, raw material costs decreased 90 basis points mainly due to an increase in product pricing and the impact of acquired businesses. Other manufacturing costs as a percentage of net revenue increased 90 basis points, primarily due to higher delivery costs and the impact of acquired businesses. Operating expense as a percentage of net revenue decreased 50 basis points. Segment operating income increased 26.5 percent and segment operating margin as a percentage of net revenue increased 50 basis points in 2018 compared to 2017. Net revenue increased 12.6 percent in 2017 compared to 2016. The 12.8 percent increase in constant currency growth was attributable to a 14.0 percent increase in sales volume, including an 11.1 percent increase due to the Royal Adhesives, Adecol and Wisdom acquisitions, offset by an unfavorable 0.8 percent decrease in sales mix and a 0.4 percent decrease in product pricing. The 0.2 percent negative currency effect was due to the weaker Argentinian peso and Mexican peso, offset by the stronger Brazilian real and Canadian dollar compared to the U.S. dollar. As a percentage of net revenue, raw material costs increased 320 basis points mainly due to higher raw material costs and the inventory step up related to the Wisdom, Adecol and Royal Adhesives acquisitions. Other manufacturing costs as a percentage of net revenue increased 120 basis points, primarily due to the acquisition and integration of Wisdom Adhesives. SG&A expenses as a percentage of net revenue increased 70 basis points due to the impact of the Royal Adhesives acquisition. Segment operating income decreased 25.2 percent and segment operating margin as a percentage of net revenue decreased 510 basis points in 2017 compared to 2016. Net revenue increased 29.9 percent in 2018 compared to 2017. The 28.2 percent increase in constant currency growth was attributable to a 23.4 percent increase in sales volume, including a 24.3 percent increase due to the Royal acquisition, a 4.4 percent increase in product pricing and a 0.4 percent increase in sales mix. The 1.7 percent positive currency effect was primarily the result of a stronger Euro and British pound offset by a weaker Turkish lira and Indian rupee compared to the U.S. dollar. Raw material costs as a percentage of net revenue increased 20 basis points. Other manufacturing costs as a percentage of net revenue decreased 40 basis points in 2018 compared to 2017. Operating expense as a percentage of net revenue decreased 190 basis points due to lower restructuring plan costs. Segment operating income increased 113.3 percent and segment operating margin as a percentage of net revenue increased 210 basis points in 2018 compared to 2017. Net revenue increased 4.3 percent in 2017 compared to 2016. The 10.9 percent increase in constant currency growth was attributable to a 6.3 percent increase in sales volume, including a 3.7 percent increase due to the Royal Adhesives acquisition, a 4.5 percent increase in product pricing and a 0.1 percent increase due to favorable sales mix. Sales volume growth was primarily related to the hygiene and durable assembly markets. In addition, we had strong growth in the emerging markets. The 6.6 percent negative currency effect was primarily the result of a weaker Egyptian pound and Turkish lira offset by a stronger Euro and Indian rupee compared to the U.S. dollar. Raw material costs as a percentage of net revenue increased 250 basis points primarily due to higher raw material costs and the impact of the Royal Adhesives acquisition offset by higher product pricing. Other manufacturing costs as a percentage of net revenue was flat in 2017 compared to 2016. Operating expense as a percentage of net revenue increased 160 basis points due to the acquisition of Royal Adhesives. Segment operating income decreased 53.1 percent and segment operating margin decreased 410 basis points compared to 2016. Net revenue in 2018 increased 5.1 percent compared to 2017. The 3.3 percent increase in constant currency growth was attributable to a 2.4 percent increase in sales volume, including a 1.5 percent increase due to the Royal Adhesives acquisition, and a 1.4 percent increase in product pricing, partially offset by a 0.5 decrease due to unfavorable sales mix. Positive currency effects of 1.8 percent compared to 2017 were primarily driven by the stronger Chinese renminbi and Malaysian ringgit offset by the weaker Australian dollar and Indonesian rupiah compared to the U.S. dollar. Raw material costs as a percentage of net revenue decreased 60 basis points compared to 2017 primarily due to an increase in product pricing. Other manufacturing costs as a percentage of net revenue decreased 50 basis points compared to 2017. Operating expense as a percentage of net revenue increased 20 basis points. Segment operating income increased 21.6 percent and segment operating margin increased 90 basis points compared to 2017. Net revenue in 2017 increased 9.5 percent compared to 2016. The 11.1 percent increase in constant currency growth was attributable to a 12.1 percent increase in sales volume, including a 3.0 percent increase due to the Advanced Adhesives and Royal Adhesives acquisitions, partially offset by a 0.5 percent decrease in product pricing and a 0.5 percent decrease due to unfavorable sales mix. Constant currency growth was primarily driven by volume growth in Greater China. Negative currency effects of 1.6 percent compared to 2016 were primarily driven by the weaker Chinese renminbi and Malaysian ringgit compared to the U.S. dollar, partially offset by a stronger Australian dollar. Raw material costs as a percentage of net revenue increased 180 basis points compared to 2016, primarily due to higher raw material costs. Other manufacturing costs as a percentage of net revenue decreased 60 basis points compared to 2016. Operating expense as a percentage of net revenue decreased 40 basis points. Segment operating income decreased 3.9 percent and segment operating margin decreased 80 basis points compared to 2016. Net revenue increased 71.4 percent in 2018 compared to 2017. The 71.2 percent increase in constant currency growth was driven by a 72.2 percent increase in sales volume, including a 72.4 percent increase due to the Royal Adhesives acquisition, partially offset by a 1.0 percent decrease due to unfavorable sales mix. The positive currency effect of 0.2 percent compared to 2017 was due to the stronger Euro and Australian dollar compared to the U.S. dollar. Raw material costs as a percentage of net revenue was flat compared to 2017. Other manufacturing costs as a percentage of net revenue were 680 basis points lower in 2018 compared to 2017 primarily due to improved operating efficiencies related to the completion of the facility upgrade and expansion project and lower restructuring plan costs. SG&A expenses as a percentage of net revenue decreased by 560 basis points in 2018 compared to 2017 due to increased sales volume. Net revenue increased 1.5 percent in 2017 compared to 2016. The 1.3 percent increase in constant currency growth was driven by a 1.6 percent increase in sales volume, including an 8.5 percent increase due to the Royal Adhesives acquisition, offset by a 6.9 percent decrease in sales volume and a 0.3 percent decrease due to unfavorable sales mix. The sales volume decline was due to lower service levels related to the facility upgrade and expansion project. Positive currency effects of 0.2 percent compared to 2016 were primarily driven by the stronger Australian dollar compared to the U.S. dollar. Raw material cost as a percentage of net revenue was 30 basis points higher in 2017 compared to 2016. Other manufacturing costs as a percentage of net revenue were 180 basis points higher in 2017 compared to 2016 due to inefficiencies related to the facility upgrade and expansion project. Operating expense as a percentage of net revenue increased 420 basis points due to the impact of the Royal Adhesives acquisition. Segment operating income (loss) decreased 493.9 percent and segment profit margin decreased 630 basis points in 2017 compared to 2016. Net revenue increased 57.1 percent in 2018 compared to 2017. The 54.6 percent increase in constant currency growth was driven by a 49.1 percent increase in sales volume, including a 39.9 percent increase due to the acquisition of Royal Adhesives, a 4.8 percent increase in product pricing and a 0.7 percent increase due to favorable sales mix. Sales volume growth was primarily driven by strong performance in the Tonsan and automotive markets. Positive currency effects of 2.5 percent were primarily driven by the stronger Chinese renminbi, Euro and British pound offset by the weaker Turkish lira and Brazilian real compared to the U.S. dollar. Raw material costs as a percentage of net revenue were 260 basis points lower in 2018 compared to 2017 due to increased product pricing and the impact of the Royal Adhesives acquisition partially offset by higher raw material costs. Other manufacturing costs as a percentage of net revenue were 280 basis points higher in 2018 compared to 2017 due to the impact of the Royal Adhesives acquisition. Operating expense as a percentage of net revenue decreased 500 basis points compared to 2017 primarily due to higher sales volume and the impact of the Royal Adhesives acquisition. Segment operating income increased 198.8 percent and segment operating margin increased 480 basis points in 2018 compared to 2017. Net revenue increased 24.2 percent in 2017 compared to 2016. The 26.0 percent increase in constant currency growth was driven by a 27.7 percent increase in sales volume, including a 9.5 percent increase due to the acquisitions of Cyberbond, L.L.C. and Royal Adhesives, partially offset by a 1.2 percent decrease in product pricing and a 0.5 percent decrease due to unfavorable sales mix. Constant currency growth was driven by strong performance in the electronics and Tonsan markets. Negative currency effects of 1.8 percent compared to 2016 were primarily driven by the weaker Chinese renminbi partially offset by a stronger Euro and Indian rupee compared to the U.S. dollar. Raw material cost as a percentage of net revenue increased 160 basis points in 2017 compared to 2016 due to unfavorable sales mix, higher raw material costs and the impact of the Royal Adhesives acquisition. Other manufacturing costs as a percentage of net revenue decreased 30 basis points in 2017 compared to 2016. Operating expense as a percentage of net revenue increased 50 basis points compared to 2016 due to the impact of acquisitions, partially offset by the net mark to market adjustment related to the Tonsan contingent consideration liability. Segment operating income decreased 6.9 percent and segment operating margin decreased 180 basis points in 2017 compared to 2016. Total cash and cash equivalents as of December 1, 2018 were $150.8 million compared to $194.4 million as of December 2, 2017. Total long and short-term debt was $2,247.5 million as of December 1, 2018 and $2,451.9 million as of December 2, 2017. We believe that cash flows from operating activities will be adequate to meet our ongoing liquidity and capital expenditure needs. In addition, we believe we have the ability to obtain both short-term and long-term debt to meet our financing needs for the foreseeable future. Cash available in the United States has historically been sufficient and we expect it will continue to be sufficient to fund U.S. operations and U.S. capital spending and U.S. pension and other postretirement benefit contributions in addition to funding U.S. acquisitions, dividend payments, debt service and share repurchases as needed. For those international earnings considered to be reinvested indefinitely, we currently have no intention to, and plans do not indicate a need to, repatriate these funds for U.S. operations. EBITDA for covenant purposes is defined as consolidated net income, plus interest expense, expense for taxes paid or accrued, depreciation and amortization, certain non-cash impairment losses, extraordinary non-cash losses incurred other than in the ordinary course of business, nonrecurring extraordinary non-cash restructuring charges and the non-cash impact of purchase accounting, expenses related to the Royal Adhesives acquisition not to exceed $40.0 million, one-time costs incurred in connection with prepayment premiums and make-whole amounts under certain agreements, certain “run rate” cost savings and synergies in connection with the Royal Adhesives acquisition not to exceed 15% of Consolidated EBITDA, expenses relating to the integration of Royal Adhesives during the fiscal years ending in 2017, 2018 and 2019 not exceeding $30 million in aggregate, restructuring expenses that began prior to the Royal Adhesives acquisition incurred in fiscal years ending in 2017 and 2018 not exceeding $28 million in aggregate, and non-capitalized charges relating to the SAP implementation during fiscal years ending in 2017 through 2021 not exceeding $13 million in any single fiscal year, minus extraordinary non-cash gains. For the Total Indebtedness / TTM EBITDA ratio, TTM EBITDA is adjusted for the pro forma results from Material Acquisitions and Material Divestitures as if the acquisition or divestiture occurred at the beginning of the calculation period. The full definition is set forth in the Term Loan B Credit Agreement and the Amended Revolving Credit Agreement, and can be found in the Company’s 8-K filings dated October 20, 2017 and November 17, 2017, respectively. We believe we have the ability to meet all of our contractual obligations and commitments in fiscal 2019. Of the $150.8 million in cash and cash equivalents as of December 1, 2018, $145.2 million was held outside the U.S. Of the $145.2 million of cash held outside the U.S., earnings on $137.8 million are indefinitely reinvested outside of the U.S. It is not practical for us to determine the U.S. tax implications of the repatriation of these funds. There are no contractual or regulatory restrictions on the ability of consolidated and unconsolidated subsidiaries to transfer funds in the form of cash dividends, loans or advances to us, except for: 1) a credit facility limitation restricting investments, loans, advances or capital contributions from Loan Parties to non-Loan Parties in excess of $100.0 million, 2) a credit facility limitation that provides total investments, loans, advances or guarantees not otherwise permitted in the credit agreement for all subsidiaries shall not exceed $125.0 million in the aggregate, 3) a credit facility limitation that provides total investments, dividends, and distributions shall not exceed the Available Amount defined in these agreements, and 4) typical statutory restrictions, which prohibit distributions in excess of net capital or similar tests. The Royal Adhesives acquisition and any investments, loans, and advances established to consummate the Royal Adhesives acquisition, are excluded from the credit facility limitations described above. Additionally, we have taken the income tax position that the majority of our cash in non-U.S. locations is indefinitely reinvested. Notes payable were $14.8 million at December 1, 2018 and $31.5 million at December 2, 2017. These amounts mainly represented various foreign subsidiaries’ short-term borrowings that were not part of committed lines. The weighted-average interest rates on these short-term borrowings were 9.6 percent in 2018 and 11.0 percent in 2017. Long-term debt consisted of a secured term loan (“Term Loan B”) and an unsecured public note (“Public Notes”). The Term Loan B bears a floating interest rate at LIBOR plus 2.00 percent (4.30 percent at December 1, 2018) and matures in fiscal year 2024. The Public Notes bear interest at 4.00 percent fixed interest and mature in fiscal year 2027. We are subject to a par call of 1.00 percent except within three months of maturity date. We currently have no intention to prepay the Public Notes. Additional details on the Public Notes and the Term Loan B Credit Agreement can be found in the 8-K dated February 9, 2017 and the 8-K dated October 20, 2017, respectively. We executed interest rate swap agreements for the purpose of obtaining a fixed interest rate on $1,450.0 million of the $2,150.0 million Term Loan B. We have designated forecasted interest payments resulting from the variability of 1-month LIBOR in relation to $1,450.0 million of the Term Loan B as the hedged item in cash flow hedges. The combined fair value of the interest rate swaps in total was an asset of $28.9 million at December 1, 2018 and was included in other assets in the Consolidated Balance Sheets. We are applying the hypothetical derivative method to assess hedge effectiveness for these interest rate swaps. Changes in the fair value of a hypothetically perfect swap with terms that match the critical terms of our $1,450.0 million variable rate Term Loan B are compared with the change in the fair value of the swaps. We entered into interest rate swap agreements for the purpose of obtaining a floating rate on $150.0 million of our $300.0 million Public Notes. We have designated the $150.0 million of public debt as the hedged item in a fair value hedge. The combined fair value of the interest rate swaps in total was a liability of $8.7 million at December 1, 2018 and was included in other liabilities in the Consolidated Balance Sheets. The swaps were designated for hedge accounting treatment as fair value hedges. We are applying the hypothetical derivative method to assess hedge effectiveness for these interest rate swaps. Changes in the fair value of a hypothetically perfect swap with terms that match the critical terms of our $150.0 million fixed rate Public Notes are compared with the change in the fair value of the swaps. We have a revolving credit agreement with a consortium of financial institutions at December 1, 2018. This credit agreement creates a secured multi-currency revolving credit facility that we can draw upon to repay existing indebtedness, finance working capital needs, finance acquisitions, and for general corporate purposes up to a maximum of $400.0 million. Interest on the revolving credit facility is payable at LIBOR plus 2.00 percent (4.35 percent at December 1, 2018). A facility fee of 0.30 percent of the unused commitment under the revolving credit facility is payable quarterly. The interest rate and the facility fee are based on a leverage grid. The credit facility expires on April 12, 2022. As of December 1, 2018, our lines of credit were undrawn. Additional details on the revolving credit agreement can be found in the 8-K dated November 17, 2017. For further information related to debt outstanding and debt capacity, see Note 6 to the Consolidated Financial Statements. Uncertainty relating to the LIBOR phase out at the end of 2021 may adversely impact the value of, and our obligations under, our Term Loan B, Public Notes and revolving credit facility. See the applicable discussion under Risk Factors. As of December 1, 2018, goodwill totaled $1,305.2 million (31 percent of total assets) and other intangible assets, net of accumulated amortization, totaled $ 908.2 million (22 percent of total assets). Key metrics we monitor are net working capital as a percent of annualized net revenue, trade accounts receivable days sales outstanding (DSO), inventory days on hand, free cash flow after dividends and debt capitalization ratio. 1 Current quarter net working capital (trade receivables, net of allowance for doubtful accounts plus inventory minus trade payables) divided by annualized net revenue (current quarter multiplied by 4). 2 Trade receivables net of allowance for doubtful accounts multiplied by 56 (8 weeks) and divided by the net revenue for the last 2 months of the quarter. 3 Total inventory multiplied by 56 and divided by cost of sales (excluding delivery costs) for the last 2 months of the quarter. 4 Net cash provided by operations less purchased property, plant and equipment and dividends paid. See reconciliation to Net cash provided by operating activities below. 5 Total debt divided by (total debt plus total stockholders’ equity). Free cash flow after dividends, a non-GAAP financial measure, is defined as net cash provided by operating activities less purchased property, plant and equipment and dividends paid. Free cash flow after dividends is an integral financial measure used by the Company to assess its ability to generate cash in excess of its operating needs, therefore, the Company believes this financial measure provides useful information to investors. The following table reflects the manner in which free cash flow after dividends is determined and provides a reconciliation of free cash flow after dividends to net cash provided by operating activities, the most directly comparable financial measure calculated and reported in accordance with U.S. GAAP. Reconciliation of “Net cash provided by operating activities” to "Free cash flow after dividends"
Net income including non-controlling interest was $171.2 million in 2018, $59.5 million in 2017 and $121.9 million in 2016. Depreciation and amortization expense totaled $145.1 million in 2018 compared to $87.3 million in 2017 and $77.7 million in 2016. The higher depreciation and amortization expense in 2018 and 2017 was directly related to the intangible assets acquired in acquisitions. Trade Receivables, net – Changes in trade receivables resulted in a $39.4 million use of cash in 2018 compared to $26.8 million use of cash in 2017 and $1.9 million source of cash in 2016. The use of cash in 2018 was related to higher net revenue and an increase in trade receivables compared to 2017. The use of cash in 2017 compared to a source of cash in 2016 was related to higher net revenue compared to 2016. The DSO was 56 days at December 1, 2018, 61 days at December 2, 2017 and 57 days at December 3, 2016. Inventory – Changes in inventory resulted in a $17.1 million use of cash in 2018 compared to an $8.7 million use of cash in 2017 and a $7.5 million use of cash of in 2016. In 2018 and 2017, inventory levels increased due to higher raw material costs and to maintain service levels while integrating our acquisitions. Inventory days on hand were 60 days at the end of 2018 compared to 59 days at the end of 2017 and 60 days at the end of 2016. Trade Payables – Changes in trade payables resulted in a $25.4 million source of cash in 2018 compared to a $44.4 million source of cash in 2017 and a $12.3 million use of cash in 2016. Both comparisons were primarily related to the timing of payments. Contributions to our pension and other postretirement benefit plans were $6.6 million, $4.7 million and $6.6 million in 2018, 2017 and 2016, respectively. Income taxes payable resulted in a $4.0 million source of cash in 2018 and a $15.0 million and $1.7 million use of cash in 2017 and 2016, respectively. Other assets resulted in a $35.2 million use of cash in 2018, a $13.0 million use of cash in 2017 and an $8.4 million use of cash 2016, respectively. Accrued compensation was a $0.3 million use of cash in 2018 and a $12.2 million and $0.9 million source of cash in 2017 and 2016, respectively. The use of cash in 2018 relates to lower accruals for our employee incentive plans and the source of cash in 2017 relates to higher accruals for our employee incentive plans. Other operating activity was a $78.5 million source of cash in 2018 an $11.1 million use of cash in 2017 and a $34.4 million source of cash in and 2016, respectively. This reflects the impact of a stronger U.S. dollar on certain foreign transactions in 2018, 2017 and 2016. Purchases of property, plant and equipment were $68.3 million in 2018 compared to $54.9 million in 2017 and $63.3 million in 2016. The increase in 2018 relates to higher purchases due to our acquisitions in 2017. In 2016, purchases of property, plant and equipment included expenditures related to a new plant in Indonesia and the Construction Adhesives expansion project. In 2018, we received $3.5 million of cash resulting in an adjustment to the purchase price of Royal Adhesives and Adecol. In 2017, we acquired Adecol for $44.7 million, net of cash acquired, Royal Adhesives for $1,622.7 million, net of cash acquired and Wisdom for $123.5 million, net of cash acquired. In 2016, we acquired Cyberbond, L.L.C. for $42.2 million, net of cash acquired and Advanced Adhesives for $10.4 million, net of cash acquired. See Note 2 to the Consolidated Financial Statements for further information on acquisitions. In 2018, we had $185.8 million of repayments of long-term debt and no proceeds from long-term debt borrowing. In 2017, we repaid $1,079.3 million and borrowed $2,856.3 million of debt in conjunction with our acquisition of Royal Adhesives and we paid $24.2 million of debt issuance costs. In 2016, there was $22.5 million of repayments of long-term debt and no proceeds from long-term debt borrowing. See Note 6 of the Consolidated Financial Statements for further discussion of debt borrowings and repayments. Cash paid for dividends were $31.1 million, $29.6 million and $27.5 million in 2018, 2017 and 2016, respectively. Cash generated from the exercise of stock options were $6.2 million in 2018, $17.7 million in 2017 and $11.3 million in 2016. Repurchases of common stock were $4.7 million in 2018 compared to $21.8 million in 2017 and $23.2 million in 2016, including $19.1 million in 2017 and $20.9 million in 2016 from our share repurchase program. There were no repurchases from our share repurchase program in 2018. 1 Some of our interest obligations on long-term debt are variable based on LIBOR. Interest payable for the variable portion is estimated based on a forward LIBOR curve. 2 Pension contributions are only included for fiscal 2019. We have not determined our pension funding obligations beyond 2019 and thus, any potential future contributions have been excluded from the table. 3 Represents the fair value of our foreign exchange contracts with a payable position to the counterparty as of December 1, 2018, based on fair market values as of that date. Future changes in market values will impact the amount of cash ultimately paid or received to settle those instruments in the future. 4 This amount includes the forward purchase contract of $9.9 million and the contingent consideration liability of $3.6 million related to the Tonsan acquisition. We are subject to mandatory prepayments in the first quarter of each fiscal year equal to 50% of Excess Cash Flow, as defined in the Term Loan B Credit Agreement, of the prior fiscal year less any voluntary prepayments made during that fiscal year. The Excess Cash Flow Percentage (ECF Percentage) shall be reduced to 25% when our Secured Leverage Ratio is below 4.25:1.00 and to 0% when our Secured Leverage Ratio is below 3.75:1.00. The first measurement period is fiscal year 2018 and the first prepayment was satisfied through amounts prepaid during fiscal year 2018. We have estimated the 2019 prepayment and is shown in the table above as due in less than one year. We expect to make cash outlays in the future related to uncertain tax positions. However, due to the uncertainty of the timing of future cash flows, we are unable to make reasonably reliable estimates of the period of cash settlement, if any, with the respective taxing authorities. Accordingly, gross unrecognized tax benefits of $8.4 million as of December 1, 2018 have been excluded from the contractual obligations table above. For further information related to unrecognized tax benefits see Note 11 to the Consolidated Financial Statements. We expect 2019 capital expenditures to be approximately $100.0 million. There are no relationships with any unconsolidated, special-purpose entities or financial partnerships established for the purpose of facilitating off-balance sheet financial arrangements. The Private Securities Litigation Reform Act of 1995 provides a safe harbor for forward-looking statements. This Annual Report on Form 10-K contains forward-looking statements within the meaning of the Private Securities Litigation Reform Act of 1995. These statements may be identified by the use of words like "plan," "expect," "aim," "believe," "project," "anticipate," "intend," "estimate," "will," "should," "could" (including the negative or variations thereof) and other expressions that indicate future events and trends. These plans and expectations are based upon certain underlying assumptions, including those mentioned with the specific statements. Such assumptions are in turn based upon internal estimates and analyses of current market conditions and trends, our plans and strategies, economic conditions and other factors. These plans and expectations and the assumptions underlying them are necessarily subject to risks and uncertainties inherent in projecting future conditions and results. Actual results could differ materially from expectations expressed in the forward-looking statements if one or more of the underlying assumptions and expectations proves to be inaccurate or is unrealized. In addition to the factors described in this report, Item 1A. Risk Factors identifies some of the important factors that could cause our actual results to differ materially from those in any such forward-looking statements. In order to comply with the terms of the safe harbor, we have identified these important factors which could affect our financial performance and could cause our actual results for future periods to differ materially from the anticipated results or other expectations expressed in the forward-looking statements. These factors should be considered, together with any similar risk factors or other cautionary language that may be made elsewhere in this Annual Report on Form 10-K. The list of important factors in Item 1A. Risk Factors does not necessarily present the risk factors in order of importance. This disclosure, including that under Forward-Looking Statements and Risk Factors, and other forward-looking statements and related disclosures made by us in this report and elsewhere from time to time, represents our best judgment as of the date the information is given. We do not undertake responsibility for updating any of such information, whether as a result of new information, future events, or otherwise, except as required by law. Investors are advised, however, to consult any further public company disclosures (such as in filings with the SEC or in our press releases) on related subjects. We are exposed to various market risks, including changes in interest rates, foreign currency rates and prices of raw materials. Market risk is the potential loss arising from adverse changes in market rates and prices, such as interest rates and foreign currency exchange rates. Our financial performance may be negatively affected by unfavorable economic conditions. Recessionary economic conditions may have an adverse impact on our sales volumes, pricing levels and profitability. As domestic and international economic conditions change, trends in discretionary consumer spending also become unpredictable and subject to reductions due to uncertainties about the future. A general reduction in consumer discretionary spending due to a recession in the domestic and international economies, or uncertainties regarding future economic prospects, could have a material adverse effect on our results of operations. Exposure to changes in interest rates results primarily from borrowing activities used to fund operations. Committed floating rate credit facilities are used to fund a portion of operations. We believe that probable near-term changes in interest rates would not materially affect financial condition, results of operations or cash flows. The annual impact on interest expense of a one-percentage point interest rate change on the outstanding balance of our variable rate debt, net of interest rate swap derivatives as of December 1, 2018, would have resulted in a change in net income of approximately $4.7 million or $0.09 per diluted share. As a result of being a global enterprise, there is exposure to market risks from changes in foreign currency exchange rates. Our operating results and financial condition are subject to both currency translation and currency transaction risk. Approximately 55 percent of net revenue was generated outside of the United States in 2018. Principal foreign currency exposures relate to the Euro, British pound sterling, Canadian dollar, Chinese renminbi, Japanese yen, Australian dollar, Argentine peso, Brazilian real, Colombian peso, Mexican peso, Turkish lira, Egyptian pound, Indian rupee, Indonesian rupiah and Malaysian ringgit. We enter into cross border transactions through importing and exporting goods to and from different countries and locations. These transactions generate foreign exchange risk as they create assets, liabilities and cash flows in currencies other than their functional currency. This also applies to services provided and other cross border agreements among subsidiaries. Our objective is to balance, where possible, non-functional currency denominated assets to non-functional currency denominated liabilities to have a natural hedge and minimize foreign exchange impacts. In the event a natural hedge is not available, we take steps to minimize risks from foreign currency exchange rate fluctuations through normal operating and financing activities and, when deemed appropriate, through the use of derivative instruments. We do not enter into any speculative positions with regard to derivative instruments. Based on 2018 financial results, a hypothetical one percent change in our cost of sales due to foreign currency rate changes would have resulted in a change in net income attributable to H.B. Fuller of approximately $8.3 million or $0.16 per diluted share. Based on 2018 financial results and foreign currency balance sheet positions as of December 1, 2018, a hypothetical overall 10 percent change in the U.S. dollar would have resulted in a change in net income of approximately $13.2 million or $0.25 per diluted share. On December 4, 2016, for our subsidiaries in Latin America, the company changed its functional currency from the U.S. dollar to the entity’s local currency based on management’s analysis of the changes of the economic facts and circumstances in which these subsidiaries operate. The change in functional currency is accounted for prospectively from December 4, 2016 and financial statements prior to and including the year ended December 3, 2016 have not been restated for the change in functional currency. The principal raw materials used to manufacture products include resins, polymers, synthetic rubbers, vinyl acetate monomer and plasticizers. We generally avoid sole source supplier arrangements for raw materials. While alternate supplies of most key raw materials are available, unplanned supplier production outages may lead to strained supply-demand situations for several key raw materials such as ethylene and propylene, several polymers and other petroleum derivatives such as waxes. The purchase of raw materials is our largest expenditure. Our objective is to purchase raw materials that meet both our quality standards and production needs at the lowest total cost. Most raw materials are purchased on the open market or under contracts that limit the frequency but not the magnitude of price increases. In some cases, however, the risk of raw material price changes is managed by strategic sourcing agreements which limit price increases to increases in supplier feedstock costs, while requiring decreases as feedstock costs decline. The leverage of having substitute raw materials approved for use wherever possible is used to minimize the impact of possible price increases. Based on 2018 financial results, a hypothetical one percent change in our raw material costs would have resulted in a change in net income of approximately $12.1 million or $0.23 per diluted share. See Note 1 to the Consolidated Financial Statements for information concerning new accounting standards and the impact of the implementation of these standards on our financial statements. We have audited the accompanying consolidated balance sheets of H.B. Fuller Company and subsidiaries (the Company) as of December 1, 2018 and December 2, 2017, the related consolidated statements of income, comprehensive income (loss), total equity, and cash flows for each of the years in the three-year period ended December 1, 2018, and the related notes, collectively, the consolidated financial statements. We also have audited the Company’s internal control over financial reporting as of December 1, 2018, based on the criteria established in Internal Control – Integrated Framework (2013) issued by the Committee of Sponsoring Organizations of the Treadway Commission (COSO). In our opinion, the consolidated financial statements referred to above present fairly, in all material respects, the financial position of H.B. Fuller Company as of December 1, 2018 and December 2, 2017, and the results of its operations and its cash flows for each of the years in the three-year period ended December 1, 2018, in conformity with U.S. generally accepted accounting principles. Also in our opinion, H.B. Fuller Company maintained, in all material respects, effective internal control over financial reporting as of December 1, 2018, based on criteria established in Internal Control – Integrated Framework (2013) issued by the Committee of Sponsoring Organizations of the Treadway Commission. As discussed in note 1 to the consolidated financial statements, the Company has elected to change its method of accounting for inventory in 2018. The Company’s management is responsible for these consolidated financial statements, for maintaining effective internal control over financial reporting, and for its assessment of the effectiveness of internal control over financial reporting, included in the accompanying Management’s Report of Internal Controls over Financial Reporting appearing under Item 9A of the Company’s December 1, 2018 Annual Report on Form 10-K. Our responsibility is to express an opinion on the Company’s consolidated financial statements and an opinion on the Company’s internal control over financial reporting based on our audits. We are a public accounting firm registered with the Public Company Accounting Oversight Board (United States) (PCAOB) and are required to be independent with respect to the Company in accordance with the U.S. federal securities laws and the applicable rules and regulations of the Securities and Exchange Commission and the PCAOB.